I could definitely use the closet organizer kit! The Shoe and Boot Kit (30pc) kit would help my organize my closet. The Mega POD (single) would be great for storing items under the bed or on a top shelf in the closet! 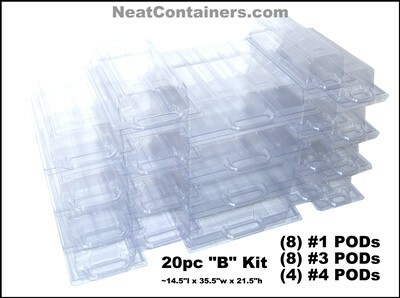 I love the NEO pods containers because they are removable – this would be perfect for my craft storage so I can pull out the type of craft I want to do and put it back when I’m done. No clutter! I’d like the shoe storage system. Thanks for the giveaway. I could really use the Shoe and Boot Kit (30pc) or the 2 PACK Mega Pod (Hat) Box . I’d like to get the Shoe Kit Starter Pack for my husband. I could most definitely use the Shoe Kit Starter Pack. I really like the 52″ Closet Organizer Kit – it would also work well in my storage room where I put seasonal clothes and shoes away. I would benefit from the shoe pods. I need the shoe kits! I would like the Closet Organizer kit and after I start to use it get another and another till my home is pod perfect! Would love to have their Shoe and Boot Kit (30pc) . The NeoPod looks as if it would work well to store small balls of yarn, etc. I’d love one of the kits to organize all my craft supplies! These look interesting. I would love to try a shoe kit. I would love the NeoPOD kit, I’d have those things filled up faster than you’d believe! The shoe starter kit… yes… I would love to be able to pull out a shoe box without all the others falling over! I would love to use the neopods, I could use those for sure. Thanks for the chance to win! The Mega Pod looks very nice! I would love the Shoe and Boot Kit . I ordered two shoe kits more than 3 months ago and have not received my order. I’ve tried calling, leaving messages, and sending email messages but have not received a response. Do not order this product. I spent approx $174 and I’ll probably never see that money again. It looked like a great product but I guess I’ll never know. Why not take this amazing product to Australia? I for one is still waiting for my order from US after two months!